The 23-year-old is a major doubt for Saturday’s trip to Vicarage Road. Juan Mata may have been making the most of some time off during the international break with a well-deserved holiday, but the Spanish midfielder is keeping his Manchester United teammate Luke Shaw in his thoughts and is backing the in-form fullback to make a speedy recovery. “After spending some time back at home in Asturias, visiting family and friends, I’m starting the week feeling good. As you all know, we’ve had a few days that are different to the norm, as there aren’t any domestic games, so we’ve made the most of being able to train hard during the week and then rest at the weekend,” Mata expressed on his weekly blog. 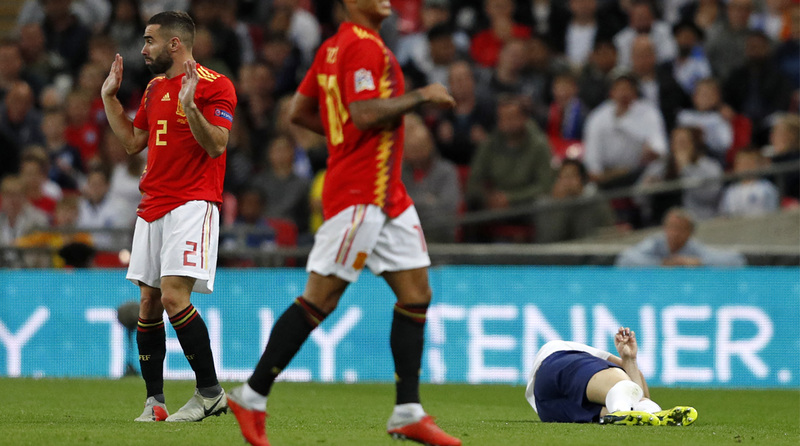 Shaw has been a revelation this season for United and has inarguably been their best player so far but he suffered a sickening injury during England’s 1-2 loss to Spain on the weekend. The 23-year-old was involved in an accidental collision with Spain fullback Dani Carvajal and had to be stretchered off with oxygen support, leaving many fans fearing the worst. The fullback, however, did tweet to claim he was doing fine and would be back on the pitch in no time. Shaw’s had a horrific few seasons riddled with injuries so official prognosis on his injury is still awaited. England have confirmed that he suffered a concussion and has returned to Manchester to work with the club’s medical team in a bid to return as soon as possible. United next take on high-flying Watford at Vicarage Road on September 15 in a clash that will test their title credentials. The Red Devils have recovered from an early-season slump of two consecutive losses to beat Burnley away, playing some of the best football in recent memory, but their visit to the Hornets will be their toughest test yet. “There is still one more international game to go before league action gets back underway, but personally I am already focused on getting myself ready for what’s to come in the Premier League, Champions League and the League Cup, as during this rather busy month we will be playing in all three competitions,” Mata added.